The premise of Heat Guy J doesn't exactly stand out in a crowd, nor does it have a very strong allure: A special unit officer with an android partner investigates possible crimes - I just yawned while typing that sentence. Odds are you will not be hooked by the end of the first, second, or even the third episode. However, it will manage to hold your attention, and once the story picks up you may need to clear your schedule for the day. The show follows Daisuke "Dice" Aurora, who comes off as a younger, blonder, friendlier reincarnation of Cowboy Bebop's Spike Spiegel. Dice and his android partner J make up the investigation team for the City Safety Management Agency. This special unit is tasked with the duty of investigating "signs which indicate that future crimes may be committed." Kyoko Milchan is the third and final member of the team; her responsibilities include managing day-to-day affairs, handling the budget, and nagging Dice about submitting his activity reports. The early episodes follow the daily ins and outs of the agency while introducing us to the new Don of the Leonelli crime family. Organized crime is ripe in the city of Judoh and the Leonellis are the front-runners. Heat Guy J reminds us that the art of storytelling is not dead. The plot begins with humble origins, but Dice's investigations lead us to a different place altogether. The progression isn't complex or confusing by any means, it's just plain good. While the main story arc isn't easily predictable, some elements are foregone conclusions like an interoffice romance between Dice and Kyoko. The interaction between all the characters is wonderful, it not only adds to their relationships with each other but also with the viewer. We really get a real sense for who these people are, a feeling that is not limited to just the lead roles. A good amount of emphasis is put on Dice's investigations, which establishes a classic detective vibe. Of course these pursuits often become dangerous inciting J to assert some authority over a criminal or two. The action is short and sweet, albeit a bit one-sided: J is incredibly powerful. While he occasionally butts heads with an illegal android or genetically altered human, it never seems like he's in real danger, and by proxy the same could be said for Dice. Though, Daisuke isn't exactly a slouch either - it would seem he borrowed more from Spike than just his laid back demeanor and relaxed posture, he's got a few of Spike's moves too . The action scenes focusing on him are fantastic, and it is a damn shame there's not more of them. 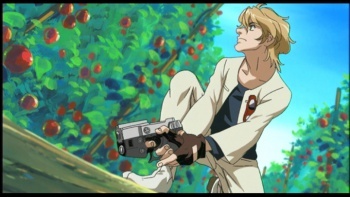 It also appears that Gene Starwind from Outlaw Star has lent Daisuke his gun. However, the agency apparently has a limited budget, so ammo is scantily provided. This is a strange problem considering the agency has no difficulty dealing with J's repair costs - I imagine this issue exists so every encounter doesn't digress into a shoot out. Atrocious 3D integration aside, Heat Guy J is visually stunning. Characters are drawn in a less than typical fashion, bearing some resemblance to Escaflowne. The background art is amongst the best I've seen, quickly garnering fascination for this world. The city of Judoh oozes personality: It is as often lively, clean, and beautiful as it is desolate, dark, and gritty. A modern styled setting is injected with sci-fi and retro components. Commonplace technology is on par with, and frequently outdated by, present day standards. More advanced technology isn't widely available, so when it does come into play it's highly effective. The animation is both excellent and not-so-good. There are moments when "camera" movements (e.g. panning and zooming) over static scenes are heavily relied upon - perhaps the studio had its own budget problems. However, the animation is top notch when it counts. At this point you may be thinking "well, gee, this may be a pretty good show, but... I'm still not sure I want to watch it, is there anything else?" one word - bagpipes. Heat Guy J has 100% more bagpipes than your average anime. The OST, Burn, has joined the elite ranks of the Cowboy Bebop,GiTS:SAC, and Hellsing OSTs on my PMP. A predominately rock sound with wailing electric guitars is infused with a Scottish influence, tribal chanting, downtempo rhythms, and an ineffable concoction of noises creating a soundtrack like you've never heard before. As for the dubs versus subs debate: the dubs are pretty high-quality, so it boils down to personal preference. That being said, I didn't care much for English voices of J or Boma. Bottom Line: Heat Guy J is slow to start, but the impressive visuals and unique styling will hold your attention until the ball gets rolling, and when it does you'll be hooked. Recommendation: This is a great series for just about everyone. If you don't appreciate the action, storytelling, well developed characters, or stunning visuals, then there is still the bagpipes. I also highly recommend the OST. Salvan Bonaminio can't seem to find his Bunny either.